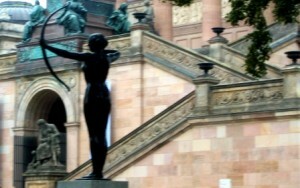 Being an urban observer’s narration of accompanying Dickens on a stroll through modern Berlin. I am a Victoriana freak, thriving on all things 19th century – as well as an avid traveler. I find it easy to turn back time, daydreaming of the age of steam when immersed in architecture, art, exhibits, literature, or films pertaining to the time. As if from a bad steam-punk novel Dickens is frozen in cryogenic sleep by some Moriarty-like villain and awakens in my Berlin cellar in 2012; where would I begin with his introduction to 21st century Berlin? 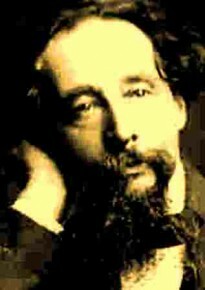 Dickens was a flaneur and keen observer himself as most writers, artists and philosophers of the time were. Somehow I can’t imagine him collapsing into a ball of fear and madness upon realizing where (and when) he has awoken. Really, our modern civilization is a mere extension, an advancement of the concepts and inventions of his day – the science-fiction of yesteryear now a reality. ‘Jules Verne was right!’ he would cry as I show him the latest images of Curiosity cruising the surface of Mars on a stream from the NASA website! So maybe it’s best to start with things more familiar (as not to attract too much attention) and take him to the more historical center of Berlin and the borough of Mitte. As we exit the U-Bahn (subway) at Alexanderplatz he would certainly be smiling to himself at the immense mass-transit network as compared to the 1870’s London underground as well as the East-bloc futurist TV-tower pinnacle rising from a cityscape spanning several eras…but probably more concerned with the state of ladies apparel. 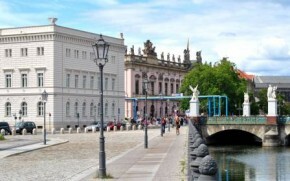 The Museum Island nestled betwixt two canals of the River Spree is site to 5 of Berlin’s finest museums ranging from ancient Egyptian, Mesopotamian and Islamic artifacts (Bode and Pergamon Museums), classical Greek and Roman to Byzantine and the Middle Ages (Altes Museum, Neues Museum) and a fabulous collection of Neo-Classical, Romantic, Impressionist and Modernism paintings (Alte Nationalgalerie) – all housed within majestic buildings of Prussian Neo-Classical style architecture. The Berliner Dom Cathedral and the oldest center of Berlin, Nikolai Quarter, being more contemporary to Dickens would make the culture-shock somewhat easier to grasp I imagine. As would Unter Den Linden Boulevard, stretching toward the Brandenburg Gate; a promenade lined with grandiose architecture including the State Opera, The Prince’s Palace, The German Historical Museum, Stalin’s Russian Embassy and The Humboldt University, just to name a few. Unfortunately due to construction the promenade of 2012 is scarred by eyesores of cranes, façade netting, scaffolding and a maze of barricade fencing funneling throngs of camera toting tourists hither and thither. 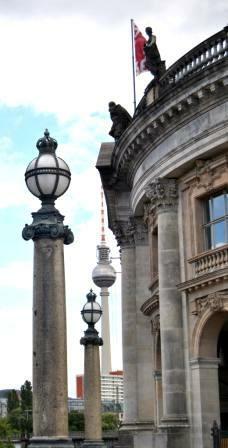 Nevertheless a part of Berlin not to be missed and a good starting point for a brisk constitutional of the capital. I would take Mr. Dickens for a pause, to the exquisite Adlon Hotel for a spot of tea (and probably a stiff drink) and proceed to fill in the historical gaps between 1870 and now. Certainly a daunting task it would be, indeed, to squeeze the remainder of the 19th century, the rise of capitalism, two world wars, the atomic bomb, an era of communism and globalization into a mere tea break? Besides the obvious advances in technology, flight, cars, electronics, telecommunication, computers and so forth, I believe he would be more fascinated with concepts and certain tools that assist a writer and the observer’s exploration: mass-tourism ( the evolution of “leisure travel” of his day and no longer exclusively for the wealthy), public libraries (still a new concept in the 19th century) , the digital camera (need I say more), and of course the entity that is the Internet… oh, and possibly a comfy pair of trainers! Alas, a day is not enough for Berlin – and certainly there is more to show Chuck (as he’s never been here)… as soon as he gives me back my i-pad! Let us not forget however, that to flaneur one requires no tools or equipment, nor must one be a wealthy intellectual, a philosopher or poet – a curios nature, a touch of social voyeurism, a contemplative eye for nuance, and above all a sense of discovery shall suffice. As for me, joining the echelons of the “uncommercial traveler”, walking with Dickens in mind through any period of time, cityscape or rural panorama, anywhere on earth, shall always be my favorite pastime. With this, my first post to The Flanuer art blog, I say hello. In future I shall endeavor to inform, reveal and hopefully enthrall with distractions and narrations of aesthetic exploration as a modern flaneur and resident of Berlin (and the world). Interesting to read about Dickens’ stroll around modern day Berlin! And thanks for refreshing my memory of the amazing city. Can’t wait to visit again.